Last year in 2015, archaeologists were surprised by their findings at the Didnauri complex, in southeast Georgia. Their excavations within the parameters of the ancient site, which encompasses a substantially long 1-mile wall (around 23 ft wide), revealed a wealth of artifacts – ranging from stone weapons, ceramic objects to bronze tools. In fact, the sheer scale of the urbanized area (gauged by satellite images), dating from around 10th-11th century BC, convinced the researchers that they were dealing with the largest ancient settlement in South Caucasus. And now the archaeologists have further established the significance of the Didnauri site, as evidenced by the discoveries of an entire water supply system, buildings specifically created for ritualistic purposes, and a grave of ancient military commander who had an arrowhead sticking to his thorax region. 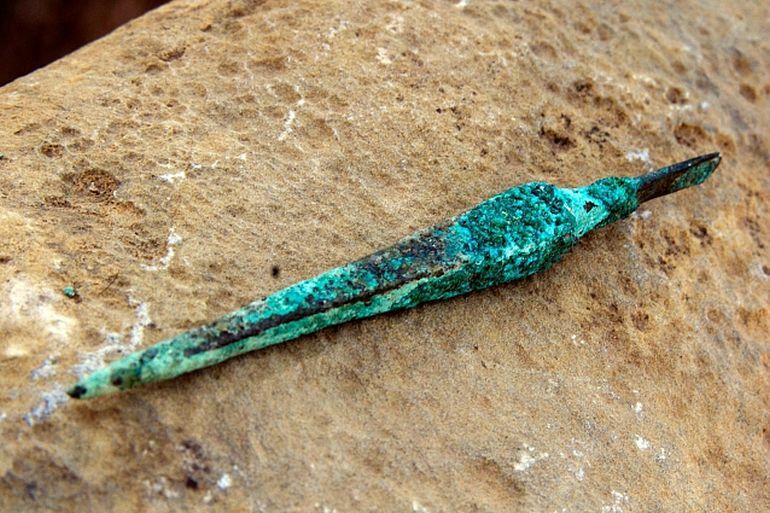 Pertaining the latter find, the male was also accompanied by a bronze dagger which dates from around 13th century BC. Interestingly enough, the researchers also noted how the aforementioned arrowhead was probably not of Caucasian origin. 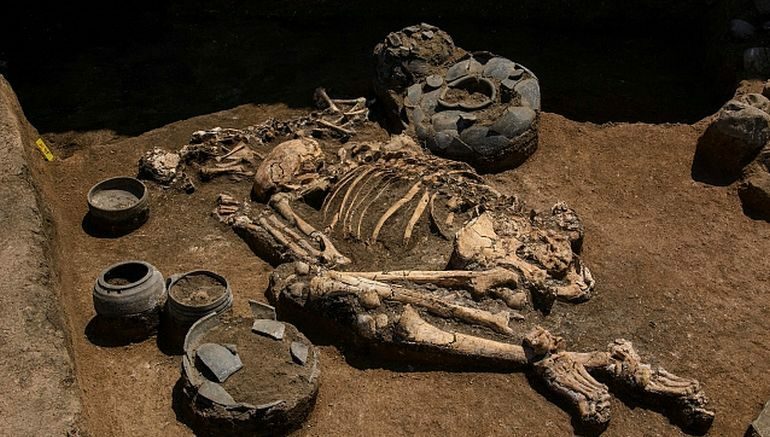 This hypothesis certainly alludes to how the commander met his demise from a foreign arrow – thus suggesting the ambit of ‘international’ conflict during the epoch of late Bronze Age and early Iron Age. Unfortunately, the initial reports have remained mum regarding the precise origin of this foreign object, at least till now. The bronze dagger found in the grave. Now historically, from around 3400 BC to 2000 BC, the southern Georgian territories were dominated by what is known, as Kura-Araxes, a Transcaucasian culture that even had its influence in the borders of present-day Iran and Syria at the territorial zenith. Suffice it to say, given the scope of geographical proximity (at times), the Kura-Araxes chieftains were heavily inspired by the lavish lifestyles of their Akkadian counterparts (circa 2300 BC), as evidenced by gold and silver burial artifacts that were inscribed with scenes reenacted from the Middle-Eastern myths and tales. However by 20th century BC, the political power of the Kura-Araxes was broken, and most of the Georgian regions were divided up into lesser fiefs. 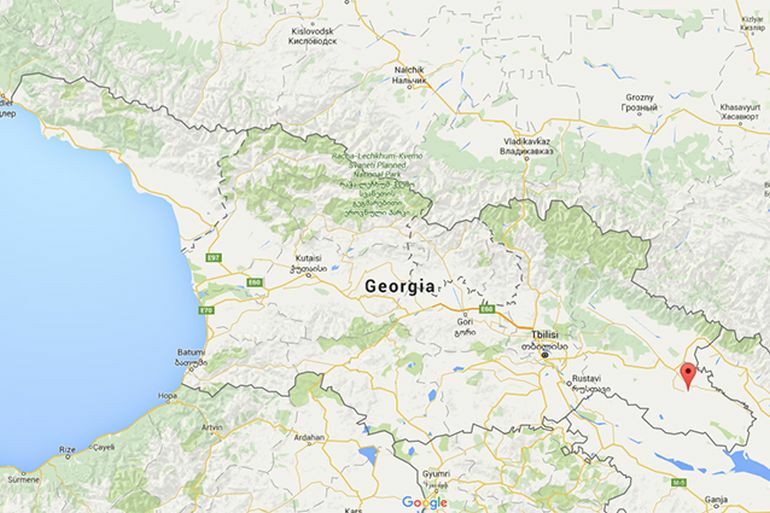 And by 1500 BC, the kurgan culture of Trialeti reached its apical stage in eastern Georgia. Now it should be noted that the archaeologists excavating the Didnauri site, are still not sure if their finds (of graves and buildings) pertain to the Trialeti, since the dates of the discoveries relate to a period some centuries later. This ambit even gives rise to the conjecture that the researchers might have come across the ruins of an hitherto-unknown civilization in southern Caucasus. In any case, more credible answers are expected in the near-future, as the Ministry of Culture and Monument Protection of Georgia has announced that the excavation project will continue for the remainder of this year. The Didnauri site at the east, pointed by the red mark. Dattatreya Mandal has a bachelor's degree in Architecture (and associated History of Architecture) and a fervent interest in History. Formerly, one of the co-owners of an online architectural digest, he is currently the founder/editor of Realmofhistory.com. The latter is envisaged as an online compendium that mirrors his enthusiasm for ancient history, military, mythology, and historical evolution of architecture.